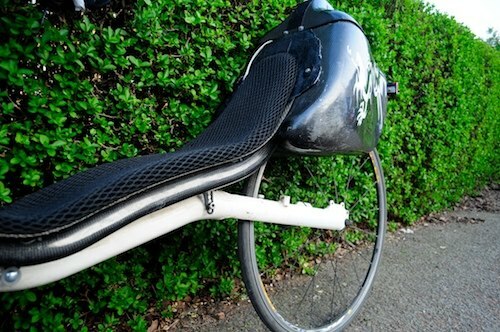 This is a copy of a post I made on the CTC forum way back in early 2009 which gives a useful perspective – at the time the most unusual bike I’d ever had was one with a single speed hub, so the novelty of riding a recumbent, let alone a lowracer, was quite eye-opening. Hopefully people who are curious about the bike but struggle with the casual familiarity displayed by experienced riders of recumbents might find this useful. 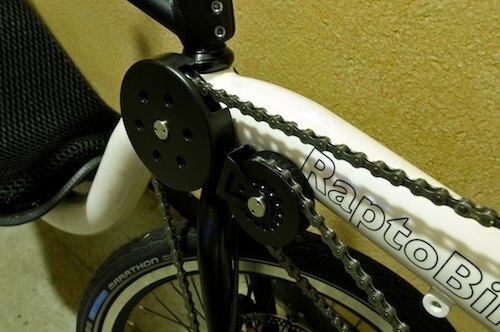 Well, last night I had a test run on the Raptobike courtesy of David Gardiner at Laid Back Bikes, and I promised to share my thoughts for what they are worth! In retrospect I have rambled out a huge post so have shuffled it under headings, apologies if it seems a little disjointed. First the obvious: it is extremely low and makes no apologies for this! The seat is ~25cm off the ground and can be reclined at just 20°. Yet this still leaves enough of a gap to negotiate most kerbs, road humps etc. without worry. And it is a beast! To get my recumbent ‘eye’ in, I rode David’s Nazca Fuego for a couple of hundred yards, then I was ready to go low… (the Fuego is a high bike in comparison) For reference I was able to comfortably balance the bike with one palm on the ground, and my arms are not particularly long! To my amazement I didn’t really find the RaptoBike any harder to start, or drive, than the other recumbents I had tried. It took me a few minutes to relax but once I trusted that the bike could really be this stable, it purred along quite contentedly. I carved a few gentle turns and negotiated some joggers and upright riders with no drama at all! The seat and headrest (not fitted as stock) were extremely comfortable. In fact I thought if you had a kickstand and brought some beer you could easily fall asleep while clipped into the Rapto… try that on my other bike! Although the frame is rigid the ride quality was very fine, with 40mm (1.5″) Marathon tyres fitted. This says a lot as Marathons are my all time least-favourite tyre! (We didn’t ride really bad surfaces though, it was all paved OK with reasonably lowered kerbs so take this with a pinch of salt). David said he could fit down to about 28mm tyres but of course you can’t unweight the bike as on an upright, so for my kerb dodging, pothole bashing adventures wide may be more sensible! Remember I didn’t have the skill / confidence to really sprint the bike in a big gear, or do any of the aggressive jinks and dives that you use to negotiate snarled up streets… but for what it’s worth, the frame and wheels were solid and undisturbed by the power I was managing to lay down. My upright bike weighs about 17lbs fully kitted out. I was prepared for the fact that the RaptoBike, for all its aerodynamic advantage, might be quite a lot more sluggish at 30lbs stock. In fact, I could hardly believe how light and responsive the bike felt – more like it weighed 20lbs than 30 I must say. We zipped along the cycle path and even climbing a couple of shallow hills, speed was completely limited by my courage and not the bike (although I have no recumbent legs, it drives very well indeed!) I would say that maybe we took it to 15-20mph and it was very steady and confident when I remembered to release my death grip on the bars! I was able to effortlessly do a ‘U turn’ by standing up from the seat, lifting the bike by the tiller and turning around – the weight distribution is quite even as the length of the bike seems balanced by the front driving wheel. Another thing you can’t so easily do on a normal bike… although you might not need to! The RaptoBike comes with nice, if not overly sporty finishing kit – it’s all brand name stuff from Avid and SRAM without any dodgy generics to be seen. The gearing of 1×8 speed would be perfect if you don’t need to climb steep hills. As it is I was not completely convinced because the fixed-wheel has made me a spinner and even the lowest gear is not dramatically low (maybe in the mid 30’s) – of course, I have no recumbent legs to compare! David had ridden the bike up the Hawes Brae at South Queensferry (which is about 7% avg I think?) so clearly a regular rider can get by OK.
You can fit a double up front via an attachment on the boom (which will also be the perfect place for lights) if you so desired. There are stops etc. brazed-on to manage the front dérailleur cable. For me I think the simplicity would be spoiled and I may just order with a slightly smaller chainring or a different cassette (especially as I want 155mm cranks). The bike comes with V-brakes which are light and simple and doing an OK job. I think maybe I would like a front disc though, to compensate for the bike’s speed on all-weather commutes – of course that’s not an option on a lightweight upright road bike (another advantage to the recumbent).. I feel like I should be able to make some comment on the fact that the Rapto is front wheel drive. But to be honest, I didn’t notice anything to remark on – I followed David through corners without noticing anything from the chain, and I didn’t get wheelspin or anything funny going on (not that we were climbing steeply), or any interference with the steering. I think if you want to squeeze down the side of a bus and do a 90 degree left turn next to the kerb, you might struggle with such a tight radius. But if you are riding ‘normally’ I can’t imagine having many FWD-related problems. If I could have ridden home on it, I would have! 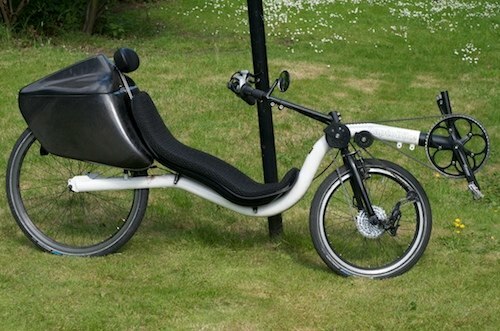 The RaptoBike really is a fine piece of kit and it is crazily cheap (for a recumbent) considering what it can do. The fact that a total novice could ride it around for an hour without any issues I think has to speak highly of the handling. It is funny being so low compared with an upright, but if I am honest I think you either can see over the cars, or you can’t. And if you can’t, even a foot of height difference will not be too relevant in safety terms. One startling thing was how excellent the mirror on the RaptoBike was; it didn’t shake and offered a completely clear, wide-angle view without any body parts or bike parts to be seen. 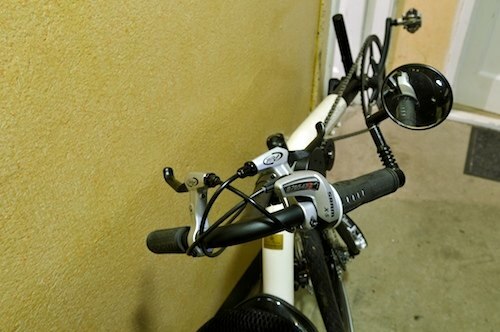 Almost as good as our car mirrors – I think it will be hard to force myself to shoulder check with one of these! Oh, and it felt just the same going at 15mph as at 5mph – like it was a bit bored and wanted to let some of the beast out! I am in David’s debt for giving up two hours of his time on a damp, cold, and windy evening to risk his nice low-racer on a beginner… if you are anywhere near Edinburgh and vaguely interested in recumbents then he is the man to speak to (here). Unbeknown to me I have been following your exploits on Youtube and places with regards to your Raptobike and, along with magazine write-ups, have ordered one; blind as I have only sat in one but never ridden. Bikefix and Laid-Back were both too far away for me to get to so I have ordered straight from Raptobike and Arnold. May I ask if you have any advice for a newbie to the Rapto scene (if not the recumbent, having a KMX Cobra for commuting and a HP Spirit 2nd hand for occasional). PS Good write-ups and vids etc. Enjoy them greatly. Arnold is still up and running OK, there’s no issue with him sending things out although a lot of people do seem to struggle to get in touch with him when he’s busy! As you already have some stick time on recumbents in general, the most I would say is – enjoy it! Apart from the power idler having a tendency to tear loose clothes, it’s a bike without major faults and you can get various idler covers to help with that too. In fact the more I ride different bikes the more I realise how sweet the Raptobike really is. Unfortunately the idler didn’t agree too well with my need for a low Q-factor (discovered en-route to Paris-Brest-Paris).